This was Port Pirie's first newspaper, printed by partners Tom Anthony and Thomas O'Brien. The rapid occupation and development of the Northern Areas during the past three or four years have given this new country such a position that its prosperity is important to the whole colony, and its failure would be an immense disaster (4 February 1876, p. 2). Tom Anthony and Thomas O'Brien were partners in a printing firm when they established the Gazette. From March 1881 Anthony ran the newspaper and its associated printing business on his own. Content Much of the news in the Gazette was connected with the town's main livelihood - shipping. 'If Port Adelaide is the front door of the colony then we may call Port Pirie the side door. We will not be so humble as to call ourselves the back door' (5 April 1878, p. 2). Promotion of the interests of the port, news of shipping arrivals and departures, regattas, and the activities of visiting sailors (including their appearances in the local courts), as well as deaths by drowning and a variety of related articles fill the pages of the newspaper. 'Captain Graham...will not be responsible for any debts contracted by his crew, without his written authority', reads one of many official notices. The same issue also carries a notice from John Calder, 'I hereby return thanks to all those Gentlemen who so kindly assisted in replacing my boat burnt by fire...' (7 February 1879, p. 3). Although the circulation of the Gazette included farmers in the surrounding 'Areas', apart from reporting the meetings of the local branch of the Farmers' Association, the newspaper did not include much material relating to agriculture. An early editorial actually claimed that the farmers were overly prone to run up unpaid bills with the local business people (3 December 1877, p. 2). In its last years, columns written under the pen-names of 'A-Jacks' and 'Phiz' contained humorous and satirical commentaries on local and wider news. Occasionally these prompted letters of complaint to the editor. Geographical coverage The newspaper claimed to have a circulation that extended as far north as Port Augusta and sometimes news from places as distant as Clare and Tanunda was included. However, the most often reported towns included Napperby (Government Dam), Georgetown, Gladstone and Port Germein. 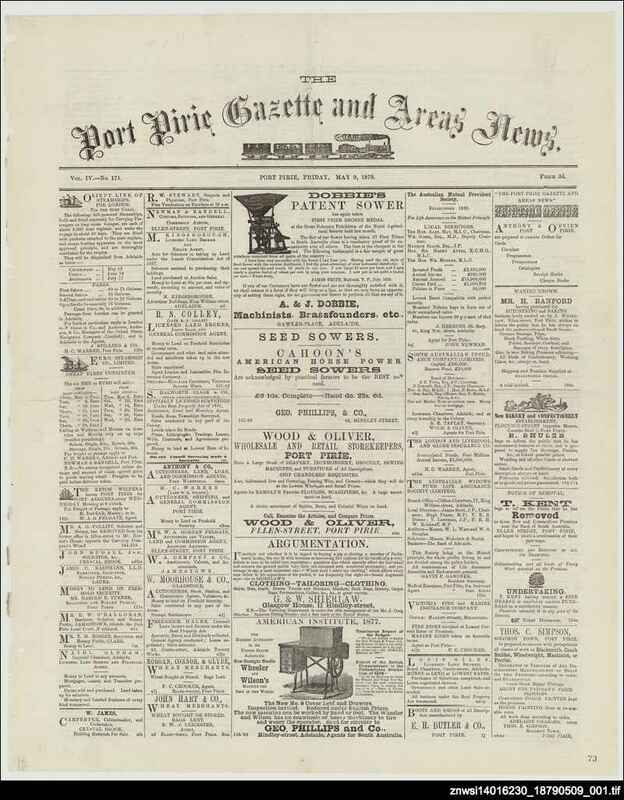 Closure The last issue of the Port Pirie gazette was printed on Christmas Day 1884. Anthony had not been pleased in 1877 when a rival newspaper was established to cover the 'Areas'. This was the Areas express, published by Joseph Pengelley of the Orroroo enterprise. By 1884 Anthony had become very bitter about the lack of support he felt in Port Pirie, and he made one final attack. The businessmen of Port Pirie have not acted in any way approaching as they should have in supporting our endeavours...The only wonder to ourselves is how, looking back on the past, we have contrived to drag out such a miserable existence so long. We have had no encouragement to progress; on the contrary, when any dirty linen had to be washed we were expected to perform the nauseating operation, as it is tautologically put, free gratis for nothing... (25 December 1884, p. 2).